Indian restaurants are off-limits since Katie is allergic to nuts, but because I don't want her to miss out on all the amazing food I've spent the last few years slowly building a repertoire of dishes I can make at home. 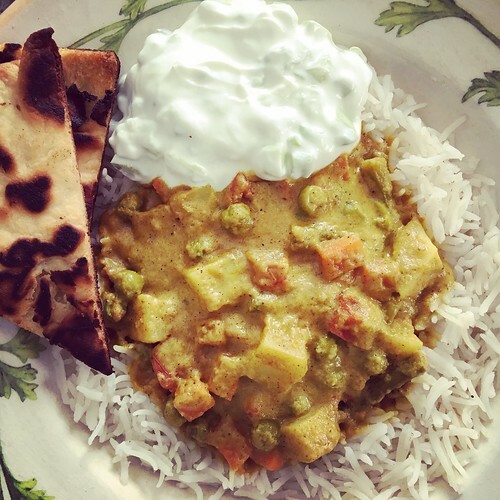 Vegetable korma is my favorite Indian dish to order whenever we try a new Indian restaurant so I was really excited to make a good at-home version. The house smelled AMAZING while this was simmering away and I'm happy to report it was just as good as the traditional version with cashews. I forgot the cauliflower in our dish, but that just means I need to make it again. Place the onion, garlic, ginger and jalapeno in a blender with 1/2 cup of water. Process until pureed. Heat the vegetable oil and butter in a large skillet over medium heat. Measure all of the spices (the curry powder through cardamom) in a small bowl. Once the butter has melted, add the spices and stir to coat the butter. You want to toast the spices to bring out their flavors. Pour in the pureed sauce and cook for 2 to 3 minutes. Add the tomato, coconut milk, yogurt, brown sugar, potato, peas, carrots, cauliflower and green beans. Stir well. Reduce the heat to a simmer then cover the pan and cook for 10 minutes. Uncover and cook another 10-15 minutes, or until the potatoes are tender. Serve with cooked basmati rice, raita and naan. Mix everything together and let sit in the fridge for a few hours so the flavors meld. 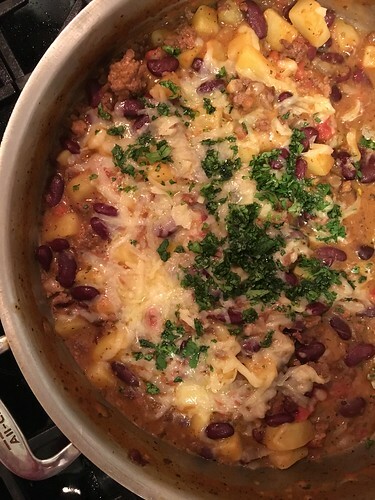 I recently saw this recipe for Crockpot Cowboy Casserole on my friend Kylee's blog. I don't use my crockpot so I knew immediately that I wanted to make this into a one pot stove top meal. I had no idea this was going to be worth blogging so I didn't take a good photo. D'oh. So you'll just have to trust me that this was delicious. Steve thought it was basically chili, which I usually refuse to make because I just don't love it. But this...so homey and comforting. And easy. So, so easy. Heat a large skillet over medium-high heat. Add the ground beef and leave it alone so it can start to brown. Add the onion and cook until the beef is fully cooked and the onions are translucent. Add the potatoes, kidney beans, diced tomatoes, cream of chicken soup, Italian seasoning, oregano, salt and pepper. Stir well and bring to a boil. Reduce heat to a simmer, cover and cook for 30 minutes or until the potatoes are tender. After 30 minutes, uncover and allow to simmer for 15 minutes to thicken the sauce. Turn off the heat, sprinkle the cheese on top and cover. Let the cheese melt before serving. 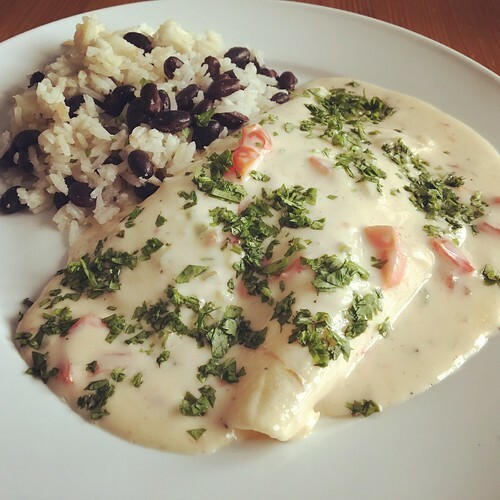 Top with cilantro and serve. 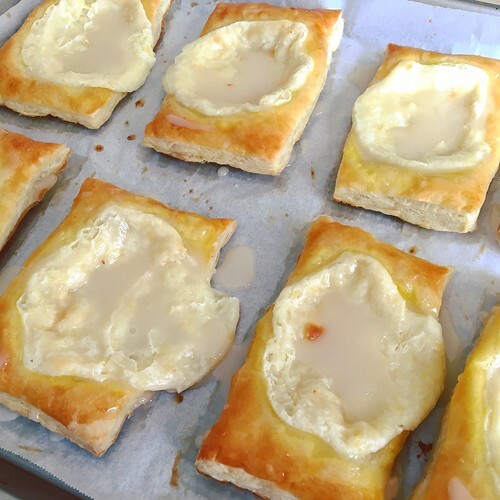 I'm so glad Kate over at Kate's Recipe Box decided to try her hand at homemade cheese danish. I love them...when they're good. And they rarely are. Most have barely a hint of cheese filling and the filling is tasteless, more texture than flavor. But these are incredible. And so easy thanks to frozen puff pastry dough. I cut my dough into 8 pieces, which was a good size for us. We all agreed that we didn't need the glaze in the original recipe. I also added a pinch of salt to the cheese filling. Thaw the puff pastry at room temperature for an hour, until it unfolds without breaking. Preheat the oven to 350 degrees. Line a baking sheet with parchment paper. Roll out the puff pastry into roughly a 9 x 13" rectangle. Cut into 8 or 12 even pieces. Lay the pieces on the lined baking sheet. Using a hand mixer, beat together the cream cheese, sugar, salt, lemon zest, and vanilla. Place about 2 tablespoons of the cream cheese mixture on top of each puff pastry, spreading out slightly so you have only a thin band of dough at the edges. Beat the egg with the water and brush evenly over the puff pastry. Bake for 15-20 minutes, until the puff pastry is lightly browned. Let cool to room temperature and serve. I think it's safe to say this blog has become just a space for me to easily share recipes with friends and family. Case in point - I posted a photo of this stir fry on IG last night and am only blogging it because a friend asked me for the recipe. I had planned to make Amy's Stir Fry Beef with Snow Peas but Steve and Katie bought snap peas, which I don't love for stir fry, and at the last minute I decided I wanted a lot more veggies. 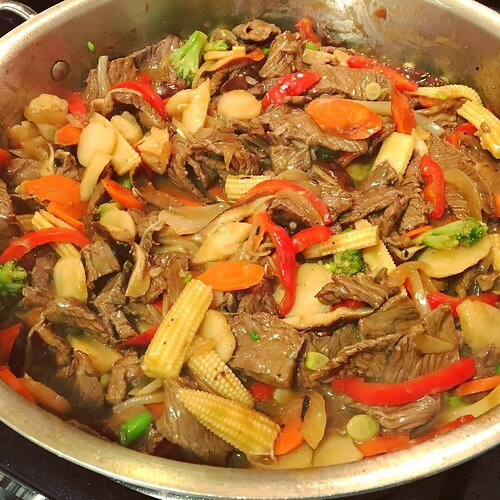 I turned to my Pork and Vegetable Stir Fry recipe for inspiration and this recipe was born. Placing the sirloin steak in the freezer for a few hours before you want to slice it helps you get super thin slices of meat. In a large bowl, mix together soy sauce, sherry, brown sugar and cornstarch. Add sliced meat to bowl and toss to coat. Set aside. 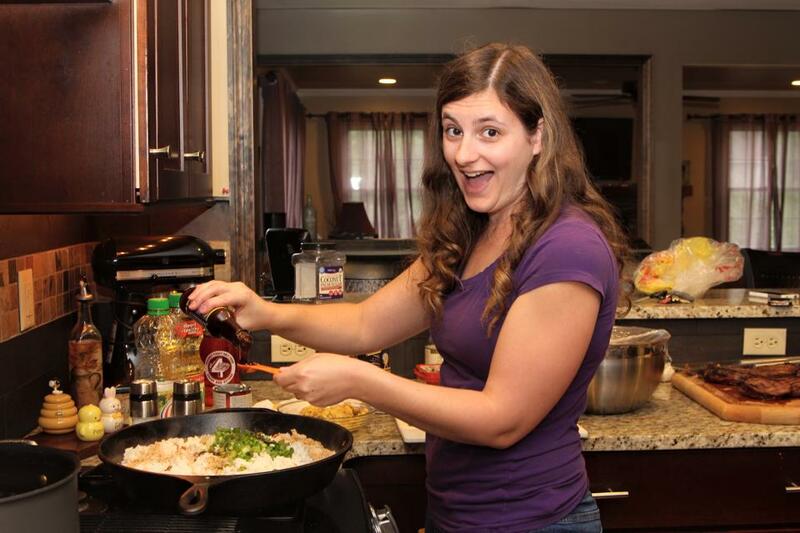 Heat oil in a heavy skillet or wok over medium-high heat. Add onion, red bell pepper and carrots and stir fry until starting to brown. Remove to a separate plate. Set aside. Allow pan to get very hot again, adding more oil if needed. With tongs, add half the meat by spreading it out in the skillet, leaving the marinade in the bowl. Let the meat sear, without stirring, for one minute. Turn meat over and cook for another 30 seconds. Remove to a clean plate. Repeat with other half of meat, allowing pan to get very hot again first. Once all the beef is cooked, add a bit more oil to the skillet and heat. Add the mushrooms, broccoli and cauliflower and snow peas. Stir over high heat for 30 seconds, then add the ginger, garlic, baby corn and water chestnuts. Stir fry until fragrant, then add in the beef, cooked veggies and chicken broth. Cook for one more minute, then add the scallions. Serve immediately over cooked hot rice or noodles. My friend Amy over at Bellyfull recently posted a photo of these Cuban Taquitos on her Instagram page. I knew immediately that they'd be a huge hit. 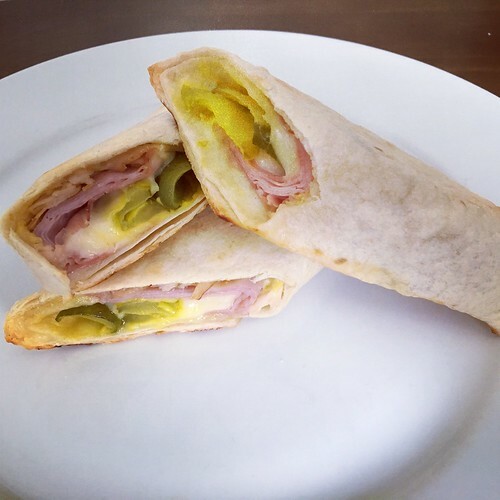 We all love the flavors in a Cuban sandwich but my usual recipe is much more time-consuming. These were so easy! I guesstimated the amounts based on how we like our Cuban sandwiches and the results were perfect. I was only able to make one small (taco size) roll-up and four larger (fajita size) roll-ups so I adjusted the amounts below. I had the leftovers for lunch today and they reheat beautifully in the toaster oven. Lay out your tortillas on a clean work surface. I find it easier to portion out amounts when you can do all of them at once. Spread some mayo on the bottom half of each tortilla. Squirt a little mustard on top of the mayo. Divide the ham and turkey evenly between the tortillas. You should be have at least two slices of each meat per tortilla. Layer on some of the Swiss and then top with one or two pickles. Roll the tortillas as tightly as you can and place on a baking sheet lined with parchment paper that's been sprayed with nonstick cooking spray. Spray the tops of the tortillas or baste with melted butter. Sprinkle some salt on top. Bake for 10-12 minutes until the cheese is melted and the meat is hot. Busy, busy, busy. That's all I can say about life these days. It's summer, so at least I've got that going for me. It's my favorite time of year and I soak it all in to get me through the cold, dark days of winter. We recently had a privacy fence installed on the part of our backyard that faces the street and quite a bit of landscaping done, so we're using our patio again. It's so lovely back there now and the weather has been cooperating so we can eat dinner outside. 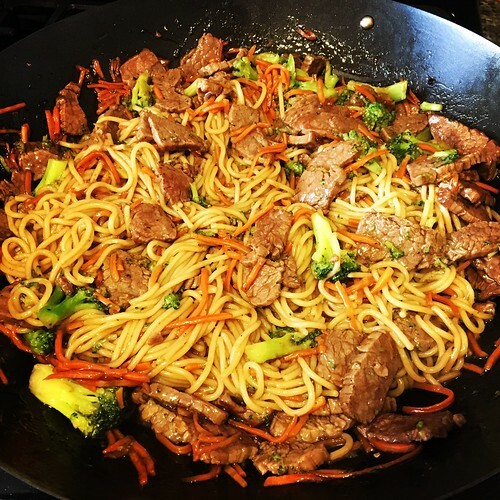 This Easy Weeknight Beef and Broccoli Lo Mein was last night's meal, eaten al fresco until the damn flies found us and made things so miserable Katie decided to finish her dinner inside while Steve and I cleaned up. And THAT is why I want a screened in porch. So...this lo mein was awesome. I thought it was a bit too sweet so I'll cut down on the sugar next time, but my family loved it. You'll see quite a large range for the flank steak. The original recipe called for half a pound but my supermarket doesn't sell such a small amount of steak, and we wanted more steak than that anyway, so I upped it to 1.5-lbs. Use however much you like. I also used oyster sauce instead of hoisin because I already had it in the house. They're completely different flavors but I think both will work fine. Cook the noodles according to package directions. Add the broccoli during the last 4 minutes of cooking. Drain the noodles and broccoli. Set aside. While the pasta is cooking, heat oil in a wok or other deep skillet over high heat. Add the steak and cook until just starting to brown. Add the garlic and carrots and cook for a minute more. In a 2-cup measuring cup whisk together the chicken broth, brown sugar, soy sauce, hoisin or oyster sauce, cornstarch, sesame oil, ginger, red pepper flakes and pepper. Add to the skillet and bring to a boil. Simmer until the sauce thickens. Add the spaghetti and broccoli to the wok and toss until incorporated. Serve. I've been on a serious Tex-Mex kick lately. I can't get enough tortillas, salsa, cilantro, cheese, avocados...I want it ALL. I saw these Soft Cheese Tacos from Homesick Texan and I was hooked. Cheese, cheese and more cheese - sign me up! There is absolutely nothing healthy about this dish but sometimes you just need to indulge. The ingredient list seems long, but it's actually a really easy meal to put together. And, surprisingly, these reheat beautifully. My only caution is to test your jalapenos before you add them to the queso. Sometimes jalapenos are more like green peppers and other times they're fiery little devils. The last time I made these one jalapeno was mild and the other was super spicy. I ended up using only a quarter of the spicy one and the queso was perfect. One more note - these are a wonderful vegetarian meal but Steve likes meat so I usually add some of the rotisserie chicken I keep in the freezer. The chicken is entirely unnecessary but know it's an option if you also live with a carnivore. In a 2-quart saucepan, heat the butter over medium-low heat. Add the onion and jalapeños. Cook until softened, about 5 minutes. Add the garlic and tomatoes and cook for 30 more seconds. Whisk together the cornstarch, milk and water until well combined then pour into the pot. Bring to a simmer and cook for a couple of minutes until it thickens. Turn the heat down to low and add the American cheese. Stir until the cheese has melted, then add the salt and cumin. Turn off the heat. Pour the oil into a 9x13 baking dish. Place the tortillas in the baking dish (it’s okay if they overlap) and move them around to make sure they all get coated with some of the oil. Place uncovered in the oven for 5 minutes until they're soft and warm. Remove the baking dish from the oven and stack the tortillas on a plate. Reserve the baking dish. To assemble the tacos, place a warm tortilla on a clean surface. Add 1/4 cup of the shredded Colby Jack down the center of the tortilla then add 1 teaspoon of the onions and some chicken, if using. Roll the tortilla then place seam side down in the reserved baking dish. Repeat with the remaining tortillas. Cover the baking dish with foil and bake for 15 minutes. Reheat the queso over low heat, stirring occasionally. Once the tacos are done, remove them from the oven and pour the queso evenly over the tacos. They'll be swimming in queso, which is what you want. Serve warm with sliced pickled jalapeños and cilantro.